Off-the-scalp powder bleach with a low ammonia conditioning formula for the utmost protection for the hair. Lightening power of 7 levels or more. A great performance and top delicacy decoloration for more than 7 shades. 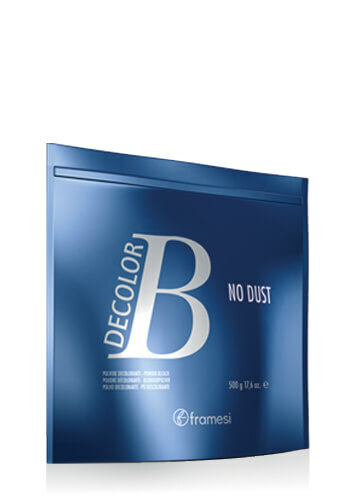 DeColor B Special Plus is a bleaching powder based on high quality oxidizing agents ensuring a strong decoloring power and on silicon by-products protecting hair all through the decoloring process. Conditioning thickener. Mixes to a very thick consistency. Stays moist throughout application and processing. Violet agents assist in refining unwanted warmth while lifting. Off-the-scalp bleach. Do not apply directly to scalp. In a small plastic bowl, mix powder with appropriate developer to achieve the level of lightening desired. Mix well with a flat brush to achieve a dense, homogeneous cream. Take the utmost care to avoid contact of the bleach with any metal.Processing time: from 20 to 60 minutes, according to type of hair and desired result. Potassium persulfate, Ammonium persulfate, Paraffinum liquidum (Mineral Oil/ Huile Minerale), Sodium metasilicate, Hydroxyethylcellulose, Magnesium carbonate hydroxide, Hydrated silica, Silica, Tetrasodium EDTA, Sodium lauryl sulfate, C.I. 77007 (Ultramarines), Parfum (Fragrance), Alpha-isomethyl ionone, Hexyl cinnamal.